The Actun Tunichil Muknal (ATM Cave) is by far, one of the best tours to take on an adventure in Belize. It's considered one of the top ten caves in the world and the Discovery Channel, National Geographic and the History Channel have all done special documentaries on this spectacular cave. Located in the Tapir Mountain Nature Reserve near the town of San Ignacio, the cave was recently discovered in 1989 by Dr. Jamie Awe and opened to the public in 1998. The Maya first began to visit Actun Tunichil Muknal during 300-600 C.E. primarily using the entrance to the cave for most of their ritual activities. Not until 700-900 C.E. did they begin to go deeper into the cavern to conduct their ceremonies. At least four major sections of the cave were used for cultural activities, which visitors can now travel into, to experience what the Maya believed was the physical entrance to the underworld. Over 1,400 artifacts have been found and cataloged in the cave, including human skeletons, making it one of the most impressive and artifact rich caves on earth. The trip starts with a 45 minute drive from San Ignacio and then an easy 45 minute nature hike through the rainforest to get to the cave. The hike includes 3 stream crossings and depending on the time of year, it might be easy to wade across or you may have to swim through a gentle current using a rope to guide you. (life jackets are supplied). Along the way, your guide will explain the geology of the cave, Mayan culture, and why the Mayan people would go into caves and perform human sacrifices. You enter the cave by swimming through a deep pool of water which is lukewarm/cold, but tolerable in the jungle heat. 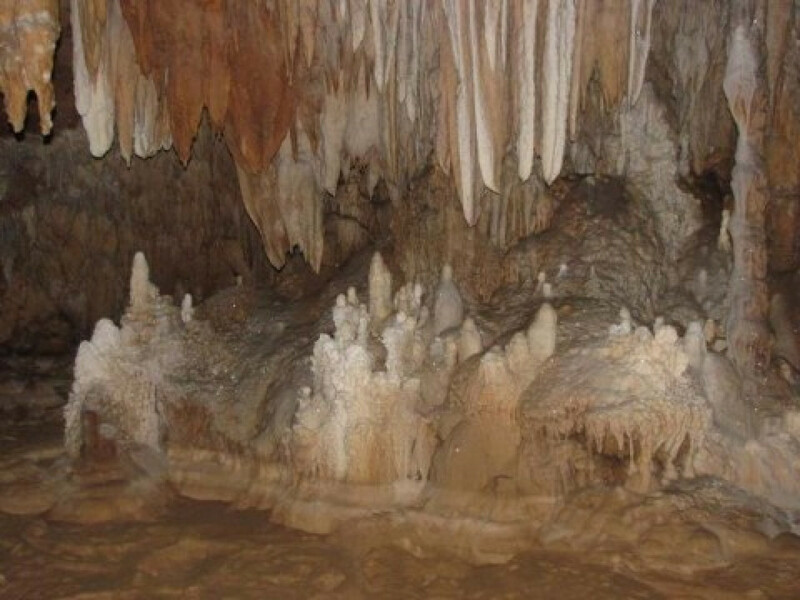 The depth of the water at the entrance of the cave is about 12 feet deep and the cave is decorated with beautiful stalactites/stalagmites formations. Then you climb over rocks in the cave and hike "in" and "out" of water. The first section of the cave consists of huge boulders that collapsed and fell thousands of years ago. You have to maneuver through this boulder section by using your arms and legs at times for leverage and support. It is not excessively hard but takes some basic strength and coordination. You then depart the wet section of the cave and enter the "dry chamber". Since it is a very sacred area, you have to take your footwear off and walk around with your socks, on soft, limestone floor for about an hour and a half. This helps preserve the cave and protect it from body oil and bacteria. Here you'll see artifacts and remains that are displayed all over the limestone floor. These priceless artifacts are over a thousand years old and haven't been touched or removed. 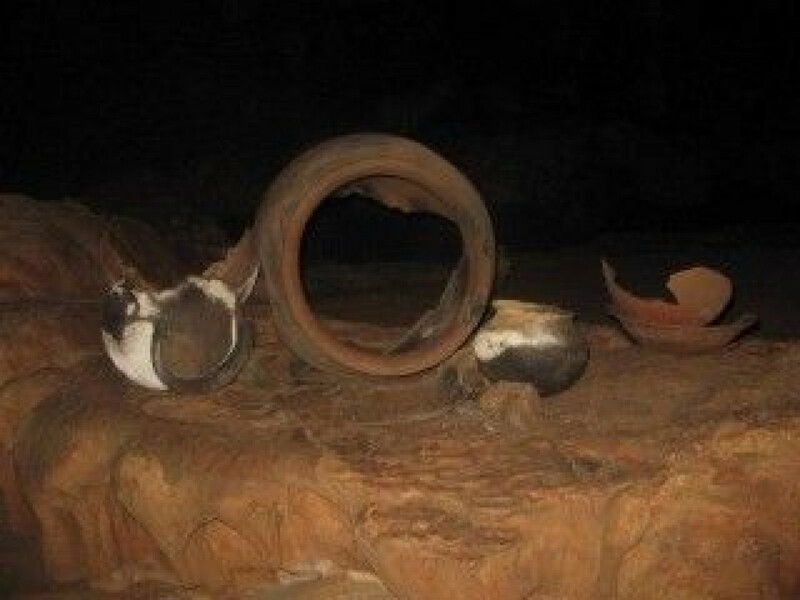 The cave houses various types of artifacts from ceramics and stoneware to the remains of skeletons. The Mayas consider Actun Tunichil Muknal a highly sacred location, enclosing the famous "Crystal Maiden," who was thought to be a sacrifice victim. After decades of weathering and natural processes, the surface of the skeleton appears to be covered with a geological sanded finish, which gives the maiden a somewhat magical fairy-dust appearance. When our travelers come to Belize we recommend the ATM Tour as the number one adventure choice, but it is not for everyone. It is not recommended for those who feel the confines of claustrophobia. Once you enter the cave there are a few tight passageways and there are many enormous chambers. It does require a good level of physical fitness due to uneven and rocky cave floors, climbing up and down ladders and around boulders, and swimming at times (lifejackets are provided for the water section of the cave). Kids should be at least 49 inches tall to do this trip. ​An early departure is essential to have the best experience in the cave without crowds. We keep our tour groups small and get there early so we can take our time and have much of the cave experience to ourselves. Closed toe sandals are required to protect your feet along with a pair of socks for walking in the dry chamber. A pair of tennis shoes that you don't mind getting wet work great as well. A change of clothes is also recommended as you will get them soaking wet at the beginning of the trip. Many people wear a bathing suit with a tank and swim shorts and some just wear athletic clothes that are comfortable and will dry quickly. No cameras or video allowed in the caves. Give me a call at 800-345-4453 with any questions or read one of our staff's experience in the ATM cave here:​ ATM Cave: Entrance to the Underworld"